In the age of climate change running rampant, it is ludicrous to forgo protecting your property with flood insurance. Yeah, sure it’s a nuisance when you are first purchasing a home; however, when a crisis strikes and a flood occurs, you won’t have to stay up at night wondering how you are going to afford the costs of repairs associated with flooding. Many home loans even require proof of flood insurance in order to give your home loan final approval. Congress mandated that federally regulated or insured lenders require flood insurance on properties that are located in areas at high risk of flooding. If you want to see whether your home falls within a high-risk area, check out www.floodsmart.gov. 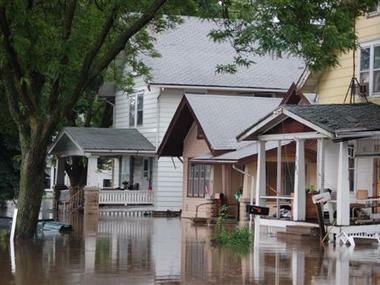 Even if, for some reason, your home loan is not contingent on flood insurance, get it anyway. Even if you don’t ever use it, you always have the peace of mind that comes from knowing that if anything were to happen to your home in the event of a flood, you would be able to afford to repair the damage caused and get back into your home quickly. According to the National Flood Insurance Program, just one foot of water could cause up to nearly $30,000 in damages to your property. If you do the cost-benefit analysis and realize that there is no alternative but to invest in flood insurance, government-backed programs are the best place to purchase it. The NFIP makes it easy for buyers to find the coverage they seek — painlessly and easily through a network of insurance agents. (Ask your current agents whether they sell NFIP insurance, or consult the NFIP website.) And although you may have a wide choice of coverage levels, a particular NFIP policy will be the same price no matter which agent or insurance company you use. Once you get the flood insurance, if you find that the payments are taking a bit of a toll on your budget, there are ways to reduce the amount of the payments each month. Some specific home improvements may make the likelihood of flooding less likely and, in turn, you could save a little bit of money by getting those done. This could be anything from installing flood vents to raising the elevation of your home by setting it on stilts. However, no matter how well you plan for a flood, the costs may be more than you anticipate and you may end up paying some money out of pocket. In order to alleviate some financial stress in this case, you and your family may want to think about creating an emergency fund specifically for use in the event of a flood. It’s always better to be safe than sorry in the wake of a flood in your home.